Jump-off Area: Barangay Bayanan, Baco, Mindoro Or. Once there was a huge mountain where people were living peacefully. One of the prominent people among them was the man named Sialdang. Sialdang was a brave man and has the power to make a hole. Sialdang met Maria and fell in love with her. He gave his whole life for her but Maria did not recognize it. She did not tell Sialdang that she never ever loved him. She just used Sialdang’s power to collect gold to become wealthy. Sialdang gave all Maria wanted but when he asked Maria to marry him, the truth was revealed, Maria would not want to marry Sialdang because she has no love for him. With all her wealth, Maria went away and left Sialdang in solitude. She had no plans of seeing him again. Sialdang was very depressed and heartbroken. Because of this, he went to the top of the huge mountain and made a deep and wide hole and hide in it. This mountain eventually became a mountain rich with unique flora and fauna. This mountain is now called Mt. Halcon, located in the island province of Mindoro. This mountain is considered as the highest peak within MIMAROPA (Region IV-B) and the 18th highest mountain in the Philippines with elevation of 8,484 ft. (2,586 meters above sea level). Mt. Halcon is the natural boundary of the two provinces of Oriental and Occidental Mindoro because it is the prominent among the Halcon Mountain Range. “Old skul” mountaineers consider this one as one of the toughest mountains on their list. This mountain has its own unique climate. It rains on its slopes nearly every day, and rains are especially strong during the wet months. Heavy rains here usually cause dangerous flash floods. The highlight of this mountain is to experience overlooking the entire Mindoro Island and the surrounding area while on the mountain peak. 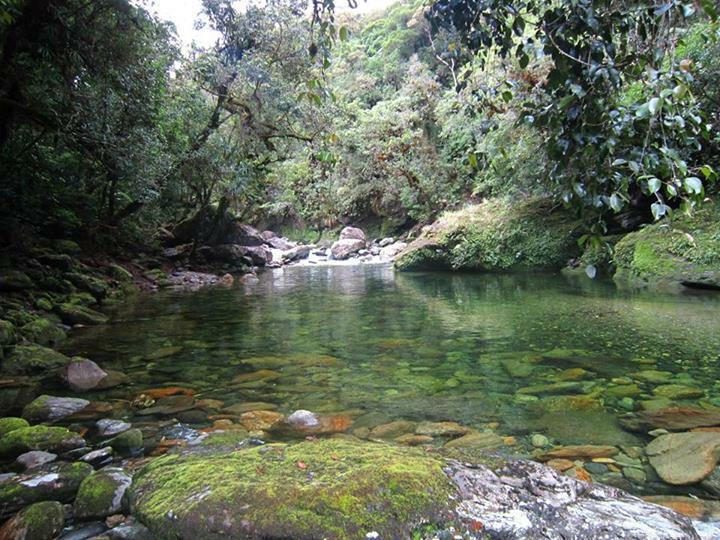 Water is abundant here and river crossing is a common experience. 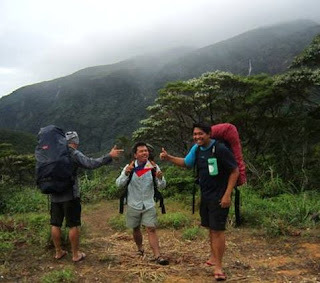 Some mountaineers already identified four kinds of forests within this mountain destination: the rain forest, mossy forest, bonsai forest and the highland forest. The mountain is home of wide variety of flora and fauna, including the critically endangered Mindoro Bleeding-heart (bird) and the stick insect Conlephasma enigma, which was first described in 2012. This mountain was closed to mountaineers due to 5-year climbing ban. The slope of the mountain is haven of eight ethnic groups who maintains their traditional culture and way of life, collectively they are known as the “Mangyan”. This is one of the Ten Must Climb Mountains in the Philippines. It was my dream to climb the Highest Mountain of Mindoro Island. I've waited for five (5) years for the reopening of the Mighty Mt. Sialdang though there were lots of invitations coming in to climb this mountain a midst its closure. The summer of 2013 was momentous event for every mountaineer because the long wait was over. An “old skul” mountaineer of Mindoro invited me to climb Halcon last Holy Week to be part of the Malaya Climbers but due to my early climb schedule to Daragang Magayon I declined the offer with the promise that I’ll climb the mountain before the end of the year. After seeing Facebook friends who were part of the Tres Malaya climbers, my heart was full of joy after seeing some parts of the green mountain of Halcon. I then decided to make a secret event; the event was called “Oplan Hamburger.” It was named “Oplan Hamburger” because we finalized the climb over the table of Mc Donald’s. It was my intention not to disclose the event’s information for the purpose of limiting the number of climbers and to choose climb buddies that can endure the four to five days of serious climbing. It was a blessing that one of the founders of Sialdang Mountaineering Club, Mtr. Dominic reaffirmed his invitation of climbing his playground. Almost two months of invitation made few individuals state their desire to climb with me but only two of them prevailed. 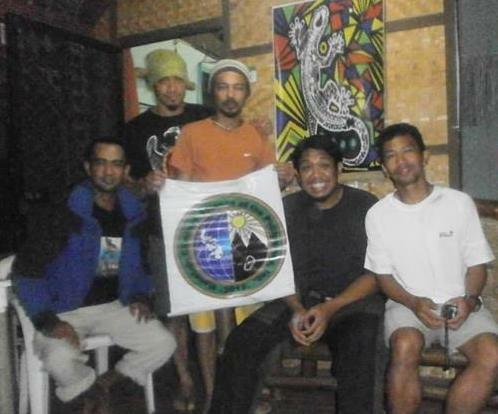 It’s my pleasure to climb with the key persons of Bad Grass Society who were also my co-members at Mountain Climbers Alliance of the Philippines, Inc. (MCAP) they’re Aleks Ibo and Paul Malla. After the month of June Meeting of MCAP we headed immediately to the Port of Batangas via Jam Liner. We just waited few minutes in the Port because we bought the ticket for the ferry leaving that time. The sea travel was enjoyable, Paul took lots of photo of mine while sleeping and most of those were open-mouth poses. Mtr. 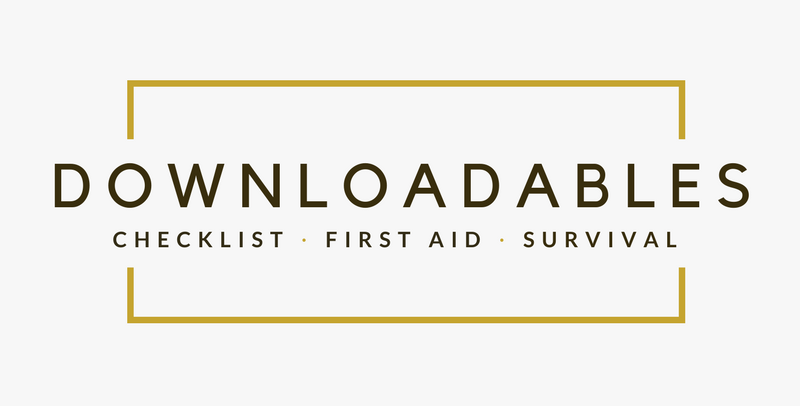 Gimparay Sialdang had constant communication with usto make sure that we are in good condition. The moment we reached the Port of Calapan, Mtr. Sialdang or Mtr. Minic taught us the easiest way to meet him and that is to visit him in his school assignment, the Benito R. Villar Memorial School of Baco. After few minutes of talking, we settled the needed permit and he instructed us to start the journey. The minutes of tricycle drive from Baco proper to Barangay Bayanan was full of good scenery. 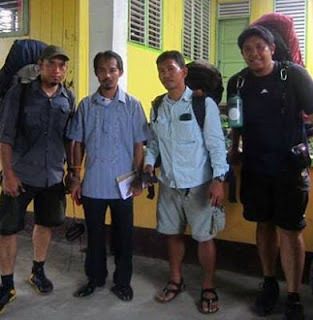 As we reached the Barangay Hall of Bayanan, we immediately asked for a guide who can also carry some of our stuffs, then the known "Boy Batak" introduced us to Moises Calo, a twenty two year-old Iraya Mangyan. We aimed to lessen the itinerary by being early but due to some courtesy call requirements we waited for the Barangay Chairman for two (2) hours but he didn't showed up and Mtr. Sialdang just instructed us to start the trek because we have the signed permit. We prayed that the expedition will be safe for everyone with good weather and also to gain some lessons both from the Mangyan and Mt. Sialdang. It was a good experience to have Moises with us who’s aside from being a Mangyan he’s also knowledgeable in biodiversity and ecosystem of Mt. Sialdang because he was part of the support crews of foreign scientists who audited the mountains species which gained the discovery of Conlephasma enigma. Our first hour rest stop was at Sitio Aruta where Mtr. 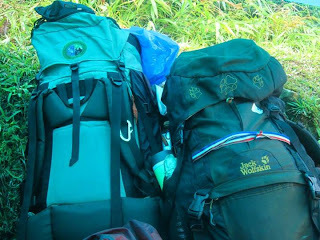 Sialdang told us to pay fifty (50) pesos per person to the sitioleader as courtesy/ donation. The sitio leader was not there at that time, only Nanay Anatalia Umalmin and the Pastor of the community church accommodated us. For me every mountaineer who will climb Mt. Sialdang should and must visit Nanay Anatalia because she discussed to me the LNT principle clearly in Mangyan context. Due to heavy rain, we just reached the community of Ayambekeg (read as Ayambukog which means “I am thirsty”). The Alangan Mangyan settlers allowed us to use their Christian community church as our haven. The Alangan Mangyan dwellers trait is being aloof to the visitors. The community’s elevation was less than 700 meters above sea level and the city light of Calapan was already noticeable. The following day, we decided to have Dulangan River Campsite also known as Camp Beverly as our campsite but due to heavy rain the guide told us that it was impossible to cross the Dulangan River. We then decided to encamp at Aplaya. Aplaya camp is in front of the Mighty Mt. Sialdang with the elevation of less than 1600 meters above sea level,there we saw 13 waterfalls formations. 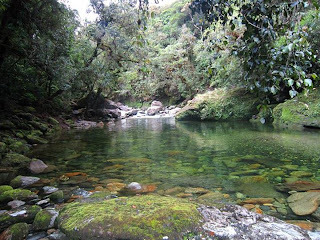 On our second day, from Aplaya we trekked down to the crystal clear Dulangan River with elevation of less than 1200 meters above sea level. Our target was to reach the summit camp site with the elevation of more or less 2400 meters above sea level. Dulangan River to target summit camp trek was full of river crossings. We’re so blessed to drink water from rivers and streams without fear or any doubt of bad effects. Due to heavy rain and strong wind plus the coldness of the weather, we settled to Karawyan (pronounced as Karahuyan which means forested) Camp. While encamped we’re told by our Manila-based climb communication officer, Rv Abiad that there were typhoon and low pressure within Mindoro Island. That night we prayed that the LORD will allow us to reach the summit. On our third day, the rain still continued so the decision to summit was the top option and reaching just the ladder was the lesser option. After an hour of walking we reached the known Azotea, from there the guide told us that it’s impossible to reach the summit due to strong winds, and crossing the knife-edge is too impossible. That was the moment wherein our faith counted, the team allowed me to pray again and asked the LORD to calm the wind, afterwards we started to climb the ladder and the wind little-by-little calmed down and we were able to trek in confidence. At exactly 12:20 we reached the Neptali’s monument/ marker and took some photos. Mtr. Aleks walked to find the highest point/ summit and after few minutes he went back and told us that summit will be minutes away. After 20 minutes of walking and experiencing a knife-edge crossing, we reached the highest point and took some photos to the “diving board” near of it unfortunately without the MCAP banner. It was a cold experience for us. I measured a 10.7 degrees Celsius (body heat) temperature that time using a Casio G-Shock Riseman, while without body heat the temperature at the summit at that time was 2.1 degree Celsius. We used trash bags as means for body heating. After one and a half hour of trekking from the summit we reached the Karawyan Camp and decamp while heavy rain continues to drop. Using Apexus tadpole tent was advantageous for us because it can be used even with just ply sheet, pole and footprint. We departed from Karawyan at 5:00 in the afternoon because the coldness of the said area was unfriendly for us, and better to have lower elevation campsite. After two hours of walking and a lot of river crossing we reached the so called “Taurus camp,” an emergency camp in the middle of two rivers. Our last day was full of hope because it was the first time for us to start a day without heavy rain. Taurus campsite to Dulangan River was a friendly walk but the trek from Dulangan to Aplaya was the challenging one, it was more or less thirty (30) minutes of uphill walking. From Aplaya, we decided to have our lunch in the place referred to as “Mountaineers’ Tambayan” (according to Moises). We enjoyed our last lunch together at the Tambayan and settled that the next rest stop is the first river near the Ayambekeg community. We reached the said river at 2:00 in the afternoon, there we managed the wounds caused by “limatik.”At 2:45 we departed from the last river and identified the Ayambekeg community as our next rest stop. Thanksagain to the dwellers for their hospitality and allowing us to use to their community church as our haven. The trail from Ayambekeg to Bayanan was unfriendly and muddy which caused us to slip many times and caused us too much delays. The expedition ended at 5:30 in the afternoon with a total seven (7) mountains crossed. The people of Barangay Bayanan kept on telling us that we were so blessed to be alive after four days of continuous raining. Upon reaching the Barangay Hall, we enjoyed the food from ate Gemma’s store (near the hall) and also the “balanghoy suman” for only two pesos each. The river within the community served as our side trip. Due to until 6:00 pm last trip of jeepneys from Baco to Calapan, we decided to grab the offer of ate Gemma’s 500 pesos motorcycle rent from Bayanan to Calapan. As we reached the City of Calapan we immediately parked at McDonald’s as our closing ceremony on one of our toughest climbing experience. After almost an hour of stay, Mtr. 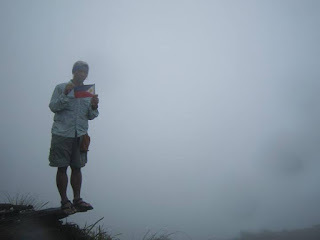 Randell, an “old skul” Sialdang Mountaineering Club member took us to Mtr. Minic’s hut. It’s a night full of laughter and good testimonies regarding the climb. There also we heard the TRUE and full version on hypothermia cause of death of Mtr. Neptali Lazaro. 1130 : Aleks:Paul,kontakin mo na si sir Minic kelangan na nating umakyat!!! 1145 : Boy Batak: Sige sir ok na po. Ok, Moises gora na hawiin na ang daan! 1645 : Camp 1 Aplaya, Behold Mt. Halcon! Dito pa lang pala ang simula! Go for Side trip- Calapan City is the gateway of Mindoro’s tourism you can explore more mountains or go for some beaches. Try to consider going to Puerto Galera. - No permit no climb in Mt. Sialdang. All permit should bar the signatures of Bayanan Barangay Chairman, Baco PNP Chief and Municipality of Baco Tourism Chief. Going to Calapan City via plane is also available daily. Beware of some individuals and tour guide agencies which offers possibility of breasting the summit of Mt. Sialdang. sir gud am. 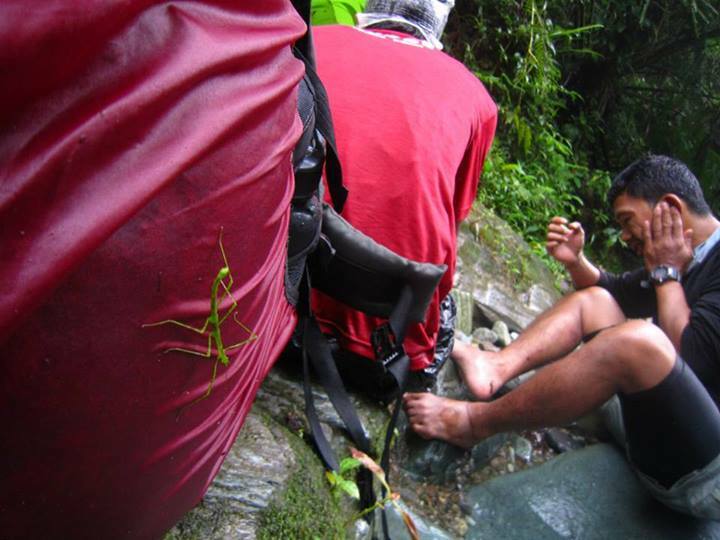 very good story ng climb nyo sir! congrats! may contact # po kayo ni mtr gimparay siadang? so it's not so expensive afterall. Hello, I live and work in Quezon City but have a place in Puerto Galera. I want to join up with any expeditions at Halcon. I expect to begin training this month of February to condition. How can I contact you all? May I ask? 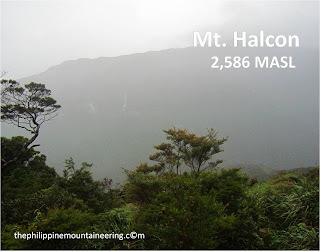 is it justice to have pay 3k for the climb to halcon?